From the Cold War to the war in Vietnam, to the struggles for equality in America’s courtrooms and streets, the assassinations of JFK, MLK, Malcolm X, and RFK, the new politics, music, fashion, and technology of the 1960s reflected a period of monumental social and political change. As the youngest of the “Baby Boom” generation, and several momentous events in the pivotal decade – , including the passage of the Civil Rights Act of 1964, the Gulf of Tonkin incident, and the Beatles appearance on The Ed Sullivan Show – turn 50 in 2014, THE SIXTIES on CNN takes a close look at the people, events, and discoveries that defined how Americans came to think about their government, their place in the world, and themselves. Executive produced by multiple Emmy® award-winning producers Tom Hanks and Gary Goetzman (HBO’s John Adams and The Pacific) of Playtone, and Emmy® award-winning producer Mark Herzog (History’s Gettysburg) of Herzog & Co. (HCO), the landmark era of the 1960s is explored through their provocative and compelling 10-part CNN Original Series, THE SIXTIES, launching on Thursday, May 29, at 9:00pmET and PT. “The 1960s represents different things to different people, but those turbulent years were undeniably consequential – altering virtually every aspect of modern American life for the generations that have come afterwards. Given their extraordinary series capturing American revolutionary history and World War II, Playtone and HCO are perfect for a production of this broad scope and tremendous ambition,” said Amy Entelis, senior vice president of talent and content development for CNN Worldwide. The premiere of THE SIXTIES on CNN/U.S. on May 29 follows the strong ratings successes of two earlier special presentations from this wide-ranging series. The Assassination of President Kennedy aired in November of 2013, as part of CNN’s commemoration of the 50th anniversary of the assassination of the nation’s 35th president, and was seen by 21.0 million total viewers, with 8.2 million viewers in the coveted 25 to 54 age demographic group. The British Invasion aired in February 2014, to mark the 50th anniversary of the Beatles’ appearance on The Ed Sullivan Show, and was seen by 14.5 million total viewers, with 5 million viewers in the 25 to 54 age demographic. 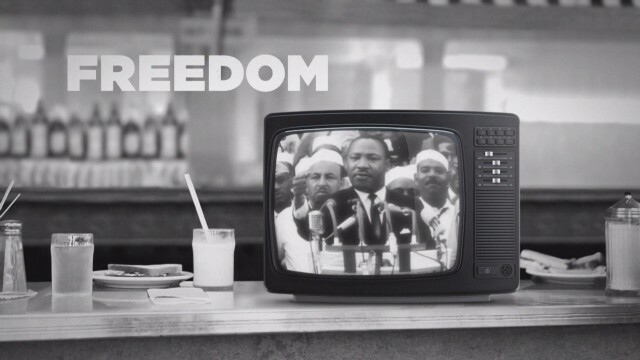 Both episodes will encore during the 10-episode run of THE SIXTIES as the network revisits the decade’s indelible impact on civil rights, music, technology, politics, and pop culture – bringing new insights to the landmark events and extraordinary people that shaped our history and character as Americans – and changed the world. Viewers can find more information on THE SIXTIES by visiting www.cnn.com/thesixties and by following @CNNOrigSeries via Twitter.